The Texas A&M Interdisciplinary Life Sciences Building (ILSB) integrates multiple academic disciplines in the search for solutions to complex problems under the general umbrella of complex biological systems. The Division of Research, as one of the user-coordinators of the ILSB, supports activities and events in the facility. 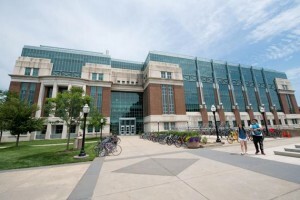 The ILSB houses researchers in several key focus areas in the life sciences, and also includes several core facilities that are critically important to progress in those areas. Core facilities in the ILSB include the Microscopy and Imaging Center, the X-Ray Diffraction Laboratory, and the Laboratory for Biological Mass Spectrometry.